Engaging people in the process helps build long-term community support for your restoration project. Every year, EarthCorps manages more than 10,000 volunteers who help with restoration projects. Volunteer management services include but are not limited to volunteer recruitment, materials acquisition and staging, providing volunteer leadership, supervision, onsite visits and volunteer event coordination with partners, providing tools and gloves, and providing light refreshments. We manage events for groups of 4-400 volunteers and tailor projects to meet the needs of partner agencies and engage the community. 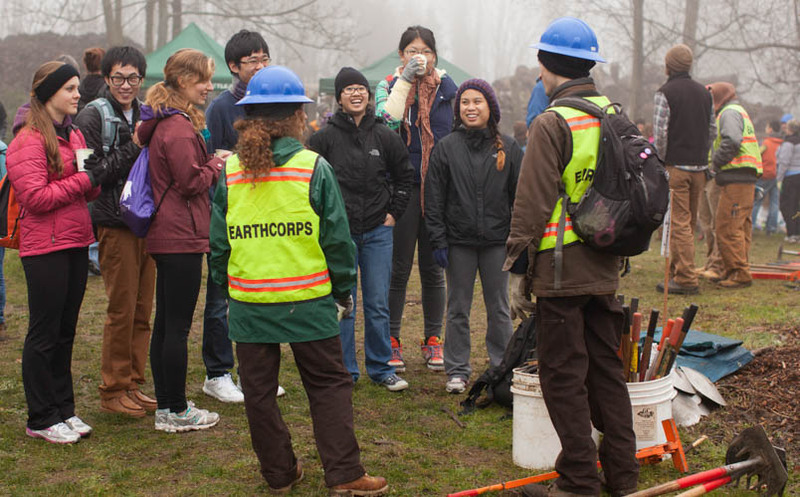 At each event EarthCorps focuses on educating volunteers with talks that cover basics in ecology, park history, safety, tool use, and environmental restoration techniques. We provide hands on demonstrations of restoration techniques to ensure volunteers are completing restoration tasks correctly and efficiently. We work closely with our partners to ensure restoration and volunteer event goals and objectives are being met. We are flexible and work diligently to meet the needs of not only our partner agencies but our volunteers as well. We strive to deliver the best ever volunteer event every time.